Collectors of early machines and music absorb a huge amount of information about their specialities and it is easy to think that everyone else knows it too. We exchange facts (and sometimes fictions!) with each other when we meet and the presentations made at Society events are packed with data. All too often this information is ephemeral, as presentation handouts and other expert work is often consigned to shelves and forgotten, with the result that it is all too easy for much of this precious history to be lost forever. In 2010 and in order to arrest this loss, the CLPGS has started a set of small works in a convenient A5 format​, the 'Reference Series'. The concept is to both capture the research done for the various presentations made to the Society and also to act as a vehicle for original work, and while prices will vary, they will remain modest. It is hoped to be able to produce new titles regularly as suitable texts are available, which should, in time, produce an easy source of reference for those interested in early recording. Many books will contain a CD of music or discographical data. The production team have a number of other titles in mind, but if there are any topics which members feel should be included or indeed have written relevant texts which would add to the Reference Series lexicon please let Keith Harrison know on kharrison@clpgs.org.uk. One aim of the CLPGS is to provide a resource for all researchers of early recordings and by increasing the knowledge base it is believed we will make Society membership even more useful to all. The production team of the Series comprises Keith Harrison, Howard Martin, Dave Roberts, and Tim Wood-Woolley. See below for a full list of titles. An Indestructible Saga, by Keith Harrison. This traces the development of the indestructible cylinder from Lioret to modern times, and includes a detailed time line of significant events. The CD included contains some rare examples of the genre including early Lamberts through to Edison Bell, Everlasting, Indestructible and Edison Amberols. by Dominic Combe. This short history of the Edison Diamond Disk was presented to the CLPGS in 2009 and explores the history of the machine, the Tone Tests and other developments. The CD contains a number of superb Diamond Disc recordings. by Frank Andrews. Frank's exhaustive study of the British scene in the early 20th Century is a detailed account of the development of the industry, covering the evolution of the disc and cylinder market and the competition between the two format at the time. The story is a fascinating one, and opens a window into the formative years of the industry. 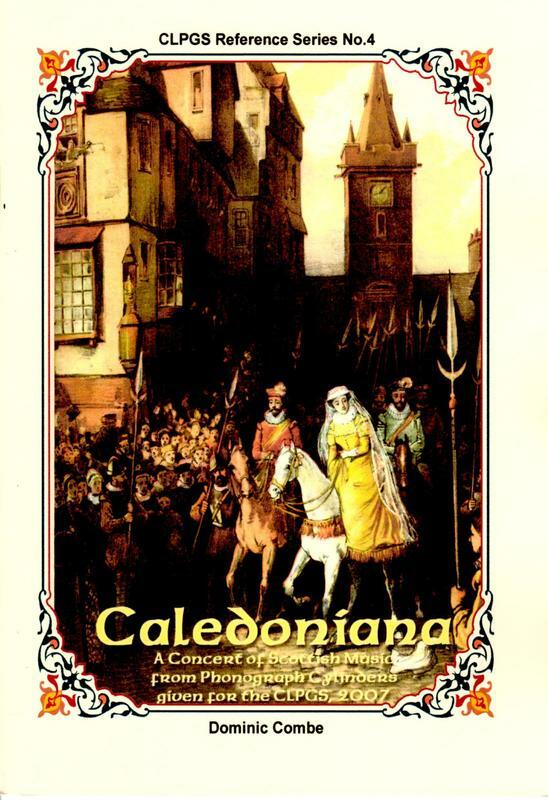 by Dominic Combe is another CLPGS presentation, this covering Scottish history and the music arising from it. The CD included contains early disc and cylinder recordings, and the text supports the music with history of both the performances and the performers. A must for Scots and Sassenachs alike. by Dominic Combe, which is the sequel to RS4, provides additional fascinating facts and music along the same theme. The subject is a large one, and the second presentation on Scottish music and artists is as informative as the first. The CD contains another 22 tracks of music with a Scottish theme. by Keith Harrison. The 2018 edition of the handbook is available, with additional manufacturers and even more entries in the list from these and from filling gaps through further research. The database CD included now provides sortable and cross referred details of some 75,000 cylinder titles, with details of performers, titles, composers, lyricists and other information. The many pictures can be loaded from the CD was well. Anyone who is interested in cylinder recordings will find this an invaluable asset. The content has grown and the 2018 edition is published in a two book set for user convenience. by Mike Field. 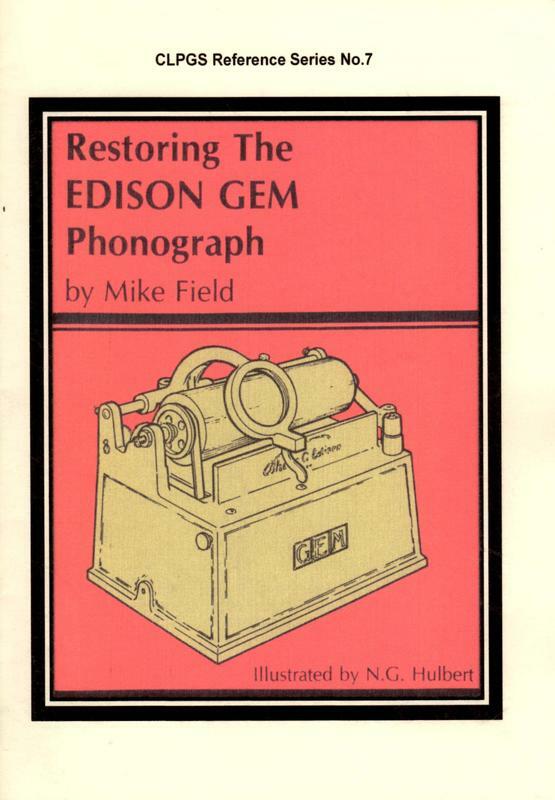 Mike was an acknowledged expert in phonograph and gramophone restoration and this is a reprint of his informative work, published by the CLPGS in 1986 and long out of print. Mike has updated the work, which is a must for anyone attempting to maintain one of these fine little machines and also for those who just want to know how they work. by Frank Andrews and Bill Dean-Myatt. This is a long-awaited meticulous discography of the Favorite and Imperial labels, and includes a history of the labels and a CD containing a computer sortable database of the records they produced. The searchable database contains fascinating data regarding matrix numbers, recording dates and other information. by Frank Andrews, is another example of his superbly detailed research. Frank charts the founding, rise, and fall of these little companies, and rare samples of their music are included on the associated CD. by Frank Andrews and Bill Dean-Myatt. This complements RS8, and is an exhaustive study of the label, including a history and a CD containing a computer searchable discography and examples of Beka company record labels. This work received the 2012 Award for "Best Research Discography in Record labels" from the distinguished Association of Recorded Sound Collections in the USA. by Dominic Combe, provides a detailed insight into the company, from its beginnings with cylinders through its battles with Edison and on to its disc production. 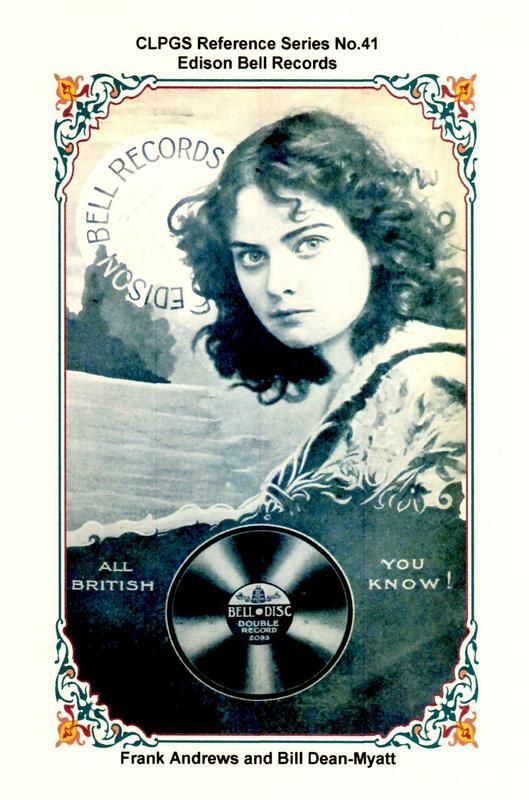 There are plenty of pictures of artists and records of all types, supported by a great CD of 25 Edison Bell tracks. Frank Andrews provides characteristic detail of the arrival and short lives of three more little British cylinder manufacturers, adding further detail to the turbulent Edwardian age of early recording. This is an ideal companion to RS9 and includes a CD containing rare recordings. by Dominic Combe. In this work Dominic researches the various methods used to duplicate acoustic recordings in the early days. Examples of each are included on the enclosed CD, demonstrating the differing levels of success that were achieved. This is an interesting study into an often overlooked problem confronting recording pioneers. by Keith Harrison. This traces the evolution and demise of the Chicago Lambert company, its cylinders and its links with companies in the UK. It contains many pictures and details of each cylinder type, and comes with a CD of rare recordings of both standard and concert sized records. The pictures in the book may also be viewed from the CD. This is another of Frank Andrews' fine accounts of early recording development, and covers the very early days of record companies in the UK when the industry was in its infancy. It makes a fine 'prequel' to RS3 and sets the scene for the boom in recorded sound in the early 20th century. Part one of a two volume set by Keith Harrison and Tim Wood-Woolley, with a pictorial history of Edison's Purple Amberols, the artists who performed on them, and the music recorded thereon. Two CDs include Amberols 29001-29039, plus two earlier Grand Opera titles. The books represent an interesting summary of the premium end of the Edison cylinder range. Part two of a two volume set by Keith Harrison and Tim Wood-Woolley, with a pictorial history of Edison's Purple Amberols, the artists who performed on them, and the music recorded. Two CDs complete the list with 29040-29077. This volume completes the range of this excellent but short-lived series of records. Dominic Combe has produced another fascinating story of musical theatre of the age on both sides of the Channel, with pictures and text taking us back to the West End of the Noughties and the Teens. The CD contains an excellent set of early popular songs from both cylinder and disc and is a wonderful piece of history. by Frank Andrews, is another detailed story of probably the last British Edwardian cylinder manufacturer to remain competing with the disc into the 1920s. The story is told using contemporary press and other comment, and is supported with pictures of the evolving box design and a music CD of Clarion and Premier cylinders. by Dominic Combe, is another journey through the heyday of early acoustic music, this time from Continental Europe. The CD contains many little-heard tracks and is well worth a listen, while the book contains translations of many of the songs recorded. In this detailed work Frank Andrews takes us through the many Sterling iterations, explaining in detail the changes in ownership in the short life of this interesting company. The associated CD contains highlights of Sterling's music, together with copies of the pictures in the book. This summary by Dominic Combe covers many of the participants in the cylinder market in Britain in the Noughties, and provides a quick reference to a lot of the smaller companies. In typical style Dominic provides an interesting background to both the manufacturers and the cylinders themselves. The CD provides a list of not often heard tracks from not often seen records. Copying material of others wasn’t a crime until suitable legislation appeared in the 1910s, and this book by Frank Andrews and Keith Harrison covers some of the larger firms which obtained their music without feeling the need to pay any performers. The CD contains many rare copies of music more frequently heard on other labels, and readers can attempt to identify the source records used by the bootleggers. This essentially 'non-academic' work by Howard Martin provides an insight into the life of an Edwardian-era singing superstar. It gives a flavour of the man, his family and the contemporary song writers who helped create the legend. Raising more questions than it answers, it is intended to encourage further research. The two CDs demonstrate a variety of Williams' singing styles, and the many pictures can be viewed in high quality on the CD as well. by Frank Andrews and Tim Wood-Woolley. This is a meld of information regarding the Amberol in the UK from Frank's sadly out of print book 'Edison Phonograph - the British Connection' with other data provided by Tim. The book contains pictures of original publicity, and the CD covers British wax and blue Amberol music and celebrates the 2013 centenary of the launch of the latter in the UK. by Frank Andrews and Bill Dean-Myatt, is the next in the series of research works containing the history of the label with a CD containing a computer searchable discography. Many pictures covering the wide variety of record labels can also be found on the CD. by Dominic Combe. Dominic has produced another musical tour of Europe, this time roaming from England to Austria. This is an ideal companion to the look at the Latin countries in RS21. In typical style he captures the sound of the region in the early twentieth Century, with much information about the 22 tracks on the accompanying CD. by Arthur Badrock. 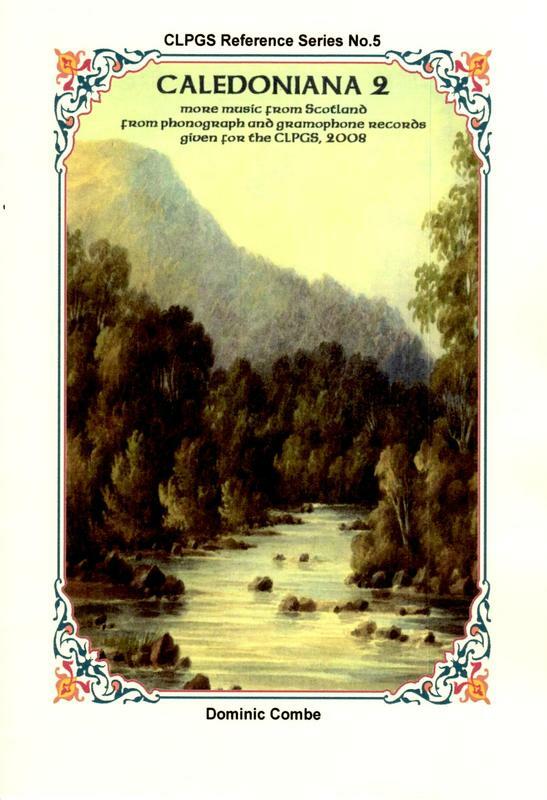 This is a reproduction of Arthur’s 2001 book, which has been out of print for some time. It shows his attention to detail and is invaluable to researchers. A full discography and details of recording artists are included. by Arthur Badrock and Frank Andrews. This is another reproduction of an out of print book containing a history, discography and artist information, with exhaustive detail of records issued on this little label. by Mike Field. Mike was a regular contributor to Hillandale and For the Record, and Mike’s Technical Forum column explained many of those little jobs we all need to do on our collections but perhaps need a clear explanation of where to start. This is a compendium of this column, with some other of his articles published at the time, and provides a great ‘how-to’ reference for us all. There are exploded diagrams to support the text, together with pictures largely taken from the original texts. by Dominic Combe, was a celebration concert presented in London in 2009 to commemorate the 90th anniversary of the founding of the CLPGS. In Dominic’s inimitable fashion we are treated to the music and its context during and immediately after the Great War, all of which would have been available to our first members. by Frank Andrews and Bill Dean-Myatt, is another master class in record label research. This has taken many years to put together and contains a typically thorough history of the various stages of the life of Imperial, with a CD containing a searchable database of all known recordings. The CD also contains a file of label pictures which can be seen better on a computer screen. by Tim Wood-Woolley, is a study of the three remaining cylinder manufacturers in production during the conflict. 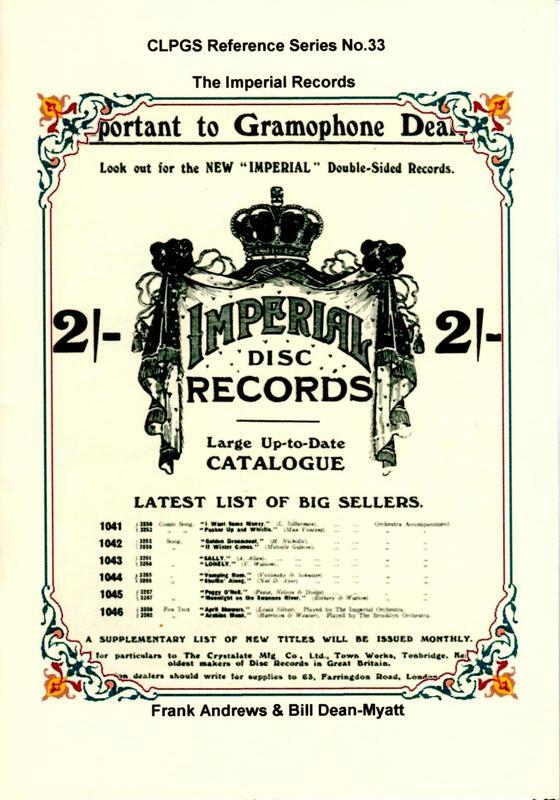 By this sad time the disc was in supremacy, but these three companies nstruggled on to provide some current music for phonograph owners during the dark days. Tim provides a CD of cylinder music of the era, containing some rare tracks not often heard. by Christopher Proudfoot. Christopher has assembled a superb collection of machines, and the photographs in the book demonstrate their quality. The story of the Decca portable range is covered in detail, along with reproductions of contemporaneous advertisements. This is a must for machine collectors. by Dominic Combe. Dominic's interest in music from the stage is well known, and this is a great summary of the evolution of the genre before and through the Great War. It is a natural sequel to RS19 and contains a CD packed with the hits of the day showing the shift in focus through the conflict and the optimism of peacetime. by Bill Dean-Myatt. Bill has produced some fine works in the Reference Series, and this is no exception, winning the ARSC 2008 award for the "Best Research Discography in Record Labels". It is a revised version of his publication of 2007, updated with additional information and listing data obtained by Bill since his earlier publication. The enclosed DVD has a searchable record listing, which now contains recording dates and locations for every side of every 78 and 45 rpm single, and also has some great pictures of Beltona labels through the years and many images of Beltona artistes and publicity. by Dominic Combe. ​Dominic has moved his study of musical theatre on another decade, and this book is a natural sequel to RS19 and 36. 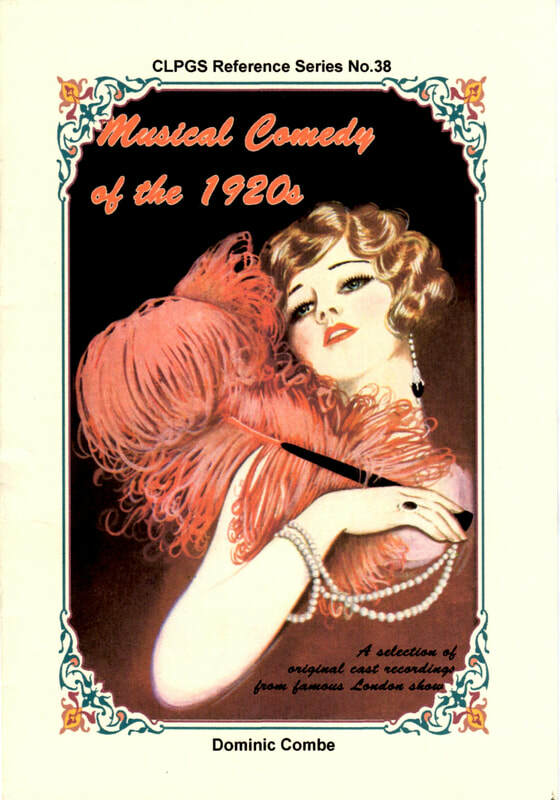 As before the detailed research into the genre comes across in the text, and the music CD is a delight for those of us who enjoy twenties musical theatre. ​by Mike Field. 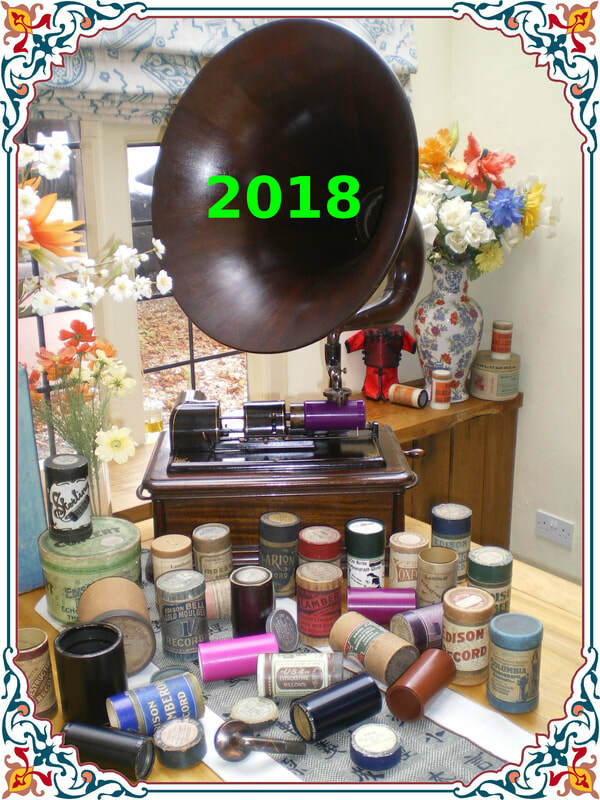 Mike published a number of articles in the Society magazines covering different models of cylinder machines which played concert sized records. RS39 is a collation of these articles, but with modern photographs taken to match the originals, and in many cases the pictures are of the very same machines reviewed by Mike at the time of his writing. The pictures can be seen on the CD enclosed, together with many recordings of these magnificent big cylinders. by Dominic Combe. Dominic gave a talk on this subject at the 2015 CLPGS Conference, and this is the substance of that, coupled with details of the tracks on the 34 track CD which accompanies the book. it is often forgotten that Pathé was a major cylinder producer, with a catalogue of over 15,000 cylinder titles, and this book is a fine tribute to them. ​by Frank Andrews and Bill Dean-Myatt. Frank and Bill were researching the history of Edison Bell for a number of years prior to Frank's passing, and Bill has now completed the work. RS41 is a cracker. Not only does it have a typically detailed history of the company but a searchable database and pictures of rare labels on the accompanying CD. This complements the earlier work by Dominic Combe on RS12. ​by Frank Andrews et al. This book is based on work by Frank, which has been updated with new information, together with articles by Tim Wood-Woolley and Keith Harrison. The text covers Vocalion in the UK and Australia, the World Record Company, the Broadcast range and the decline of the company in the 1930s. The CD lists catalogue and matrix numbers of over 16,000 Vocalion produced sides from the UK, Europe and Australia, including Aco, Broadcast, Little Marvel and many wholesale products. The CD contains databases in Catalogue and Matrix order, with label pictures and more. In 2018 RS44 was awarded a Certificate of Merit by the American Association of Recorded Sound Collections. ​by Dominic Combe. A century ago the world was in turmoil and the daily newspapers were not cheerful reading. Despite this some 21 upbeat musical shows were produced in London, and Dominic has collected some excellent examples of these in this Reference Series issue. In his inimitable style Dominic tells the plots of 14 of the shows staged that year and details of their runs, and the CD contains splendid examples of music from these shows performed by the original casts. This collection tells volumes about the mood of the day and is not to be missed. by Dominic Combe. 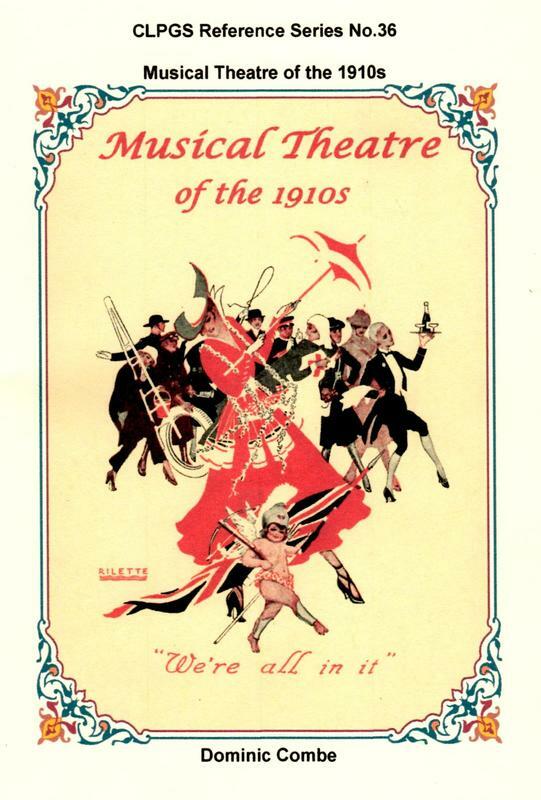 Dominic has continued with his series concerning musical theatre in the teens, and this product covers the year in which the War to End All Wars finally ended. Once again Dominic treats us to reviews and music from the key shows of the year, all of which are surprisingly upbeat and optimistic. This is a good sequel to RS43 and in a way opens the door to the crazy twenties.